The heavily tuned roadster will rocket down the Autobahn at over 211 mph. The Mercedes SL may not be as focused a driving machine as, say, the AMG GT. But in SL63 spec, it's no slouch. And one notable tuner is taking it even further. The latest tuning project from G-Power amps the eight-cylinder roadster up to 800 horsepower and 811 lb-ft of torque. 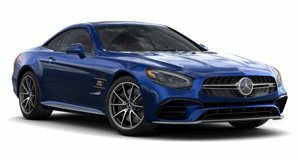 That's a considerable increase over the 577 hp and 664 lb-ft with which it comes stock from the factory, produced by Affalterbach's hand-built 5.5-liter twin-turbo V8. As a result, the tuner says its customized roadster will reach 62 mph in just 3.5 seconds. What's more is that it'll keep pulling until it's well past 211 mph, which could come in handy on the derestricted stretches of Autobahn criss-crossing the country in which this SL was built and tuned. For those keeping track, that's more power and torque than any version of the AMG GT. A higher top speed too, and accelerating beating or matching all but the top GT R.
To get it there, G-Power modified the turbochargers, recalibrated the engine software, and fitted a new exhaust and catalytic converter. The spools alone feature bigger wheels for the turbine and compressor, and reprofiled turbine blades. The turbos are contained in special CNC-machined housings. And the whole thing rides on a special set of 21-inch forged alloys, made from aircraft-grade aluminum and diamond-cut with a high-sheen, jet-black finish. The get all that muscle down to the tarmac, those alloys are fitted with rather wide and low-profile rubber. The rear rollers measure nearly a foot across – almost half an inch wider than the considerable tubes of rubber with which the SL63 comes stock, and as wide as any fitted to the GT short (once again) of the top R model.